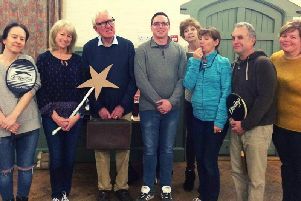 A play combining live action with archive film footage which was shot over 25 years ago featuring local children from Northamptonshire is to be performed this week. Lydia By Any Other Name is a story about two former child stars Steven Chambers and Rosemary Tomms, now middle aged, separated, each with two children, both living separate lives, and of a bizarre coincidence which reunites them. The play’s focus is the relationship that develops between Lydia (Eleanor Morrison), an only child who is seen by her peers as an outsider and dresses in a non conventional way, as a tomboy, and her semi retired grandmother Rosemary (Jaki Loudon ). The performance starts at 7.30pm tomorrow (Friday) and Saturday, May 30. There is also a performance at 6pm on Sunday, May 31. It can be seen at The Looking Glass Theatre, The Old Newspaper House, Northampton (opposite the Derngate stage door) and is suitable for children. Admission £8 and £10 and can be booked by calling 01604 624811.